With the Age of Ultron set to premiere in the US this coming Friday, it’s a good time to look at his comic book origins. I thought I would share some of what I feel are good stories you could check out to get a feel for Ultron’s origins. While far from comprehensive, this is a good primer if you wanted to familiarize yourself with him prior to seeing the movie, or now that you’ve seen it, you want to read more about him. Like I said, this is not a comprehensive list of Ultron appearances, but several notable stories to check out. All of these issues are available on Comixology, and you may be able to find them in collections or your local comic shop. Ultron’s first appearance was not actually the story of his creation and gaining sentience. His first appearance was actually in another guise, that of the Crimson Cowl, the second leader of the Masters of Evil. As the Cowl, he led the Masters to defeat the Avengers, and used their brainwashed butler Edwin Jarvis to trick them into thinking they had been betrayed. He revealed himself and his true origins at the last moment, and ordered the Masters to destroy the Avengers, who were chained to missiles. The Black Knight was able to free the Avengers, and the team defeated Ultron. Ultron swore revenge. At this point, Ultron was actually Ultron-5, the fifth major upgrade since his creation by Hank Pym. This numbering was a common theme with Ultron and came into play significantly in multiple stories. He also revealed that he had purged the memory of his creation from Pym’s mind using hypnosis. He only waited a matter of months before creating the Vision, a synthetic humanoid android, with the help of Profession Horton (creator of the golden age Human Torch) and sending him after the team. The Vision rebelled against his own father, and soon after joined the team. This set up an adversarial relationship between “father and son” that would last to the modern day. 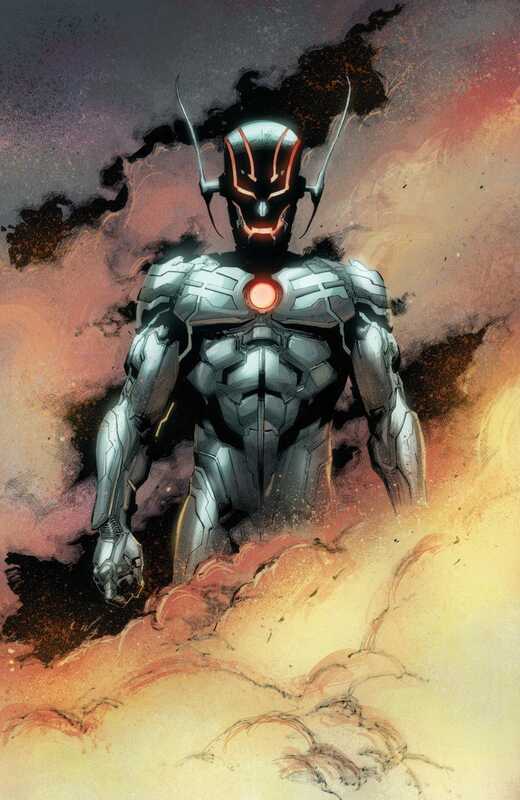 In Ultron’s next appearance, he took control of the Vision and forced him to rebuild his body from Adamantium, creating Ultron-6, or the Ultimate Ultron. He then attacked the United Nations to kidnap and absorb the knowledge of a Dr. MacLain, a roboticist that he desired to build him a new robot army. The process went wrong, and Ultron self destructed. MacLain turned out to be Hank Pym in disguise. This might seem like an insignificant story compared to the first two, but it established two things- first using backdoors in his progeny’s programming to ensure his life would continue and his desire to create a robot army. In his second successful attempt to create new life, Ultron’s goal wasn’t to create a weapon, but a companion. To do so, he hypnotize Hank Pym into transferring Janet Van Dyne’s mind into an android body, called Jocasta. Jan notified the Avengers, who rescued her and reversed the transfer process. However, some of that programming remained, and Jocasta soon activated on her own. Jocasta was instrumental in helping the team defeat Ultron, distracting him by reciprocating his feelings long enough for Ms. Marvel, Scarlet Witch, and Thor to attack and stop him. Ultron had several other appearances over the next few years- including a major role in the Secret Wars, a change of heart (that version was killed by his predecessor), and a bout of insanity. Several years later, Ultron attempted to create another mate, Alkhema the War Toy, based on West Coast Avenger Mockingbird. Although Alkhema rebuffed his advances, she shared in his desire to replace humanity with artificial life. The West Coast Avengers stop the pair, who escape. Although he surfaced again several times in the years after Alkhema’s creation, none of those appearances were as significant as this story. After a series of attacks that left Hank Pym, the Wasp, Vision, Quicksilver, Scarlet Witch and Wonder Man missing, and the return of Alkhema, the Avengers are horrifed to learn that Ultron has slaughtered every inhabitant of the small nation of Slorenia in a matter of 3 hours. The Avengers lead a UN task force in an invasion of Slorenia, but are even more horrified to discover that Ultron has transformed the population into mindless cyborg war machines. Meanwhile, Ultron reveals that he plans to use the six kidnapped Avengers, and Wonder Man’s brother the Grim Reaper, as the templates for his own robotic family. The captive Avengers are able to free themselves, while the five Avengers leading the UN forces battle through the zombified Slorenians, and hundreds of Ultron’s past selves, culminating in one of the greatest Avengers moments of all time. Building on Ultron’s history, this story also adds an important trait to him- his own synthetic brain is revealed to be modeled on Hank Pym’s. Simply put though, this is the greatest Ultron story of all time, and one of the top Avengers stories ever written. After another attack on Earth, including using Tony Stark’s body and armor to create a new female form (yup! ), Ultron blasted his program into the stars. There, he conquered a synthetic race called the Phalanx. He then led them into an invasion of known space, where he was opposed and defeated by a rag-tag team of cosmic heroes, which included Star-Lord, Gamora, Drax, Rocket Racoon, Groot and Nova. Yup. Ultron is responsible for banding together the Guardians of the Galaxy as we know and love them today. Although most of them worked together in the first Annihilation story, it was Ultron’s invasion that inspired them to officially band together as a team. Finally, Ultron returned from space, attacked the Avengers and promptly vanished. A short time later countless Ultron drones swarmed and conquered the planet. The Avengers learned that Ultron was controlling his forces from an undetermined point in the future, out of their reach. In a last ditch plan, Wolverine and Invisible Woman went back in time, and killed Hank Pym before he could create Ultron. Unfortunately, that actually turned out WORSE, and they went back again, this time stopping themselves and convincing Hank to program in a backdoor to stop Ultron. This story shares a name only with the upcoming movie, but it’s probably Ultron’s biggest moment. He actually ruled the world. There actually has been one more major Ultron story, last month’s Avengers: Rage of Ultron, but it’s a bit too recent to get into, and there’s still a little confusion about where it fits in Marvel continuity. Are there any Ultron stories you might add for a new reader?